I am creating a newform.aspx page for cutsom SPList in SPO site. I want to add an image with dynamic text thats embedded within anchor tag, <tr> or <td>. 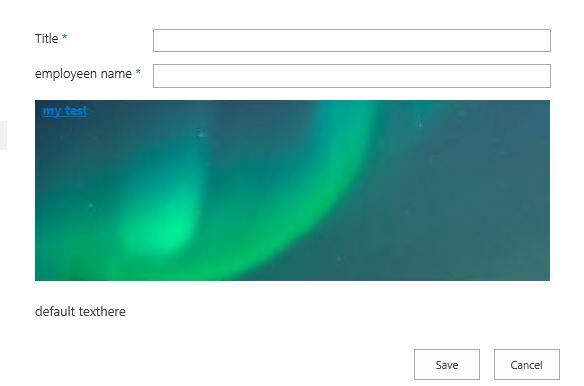 This image with the dynamic text must be placed immediately above first field of the form. Assume , I have some fields in the way, employeename, number, address, etc. So, just above employeename field, I want to add a <tr><td> <a href ==> with < img src=../../someimage.jpg >' + mydynamictext+ ' </td></tr>. I would like to add an attachment button to be able to upload files and images. How this can be done? Not the answer you're looking for? Browse other questions tagged sharepoint-online office-365 jquery newform or ask your own question.